Preview images and official description for the Jane the Virgin season finale "Chapter Sixty-Four"
“Chapter Sixty-Four” is the title of the May 22 finale of Jane the Virgin Season 3, and The CW has released some wedding pictures and a description to promote it. SEASON FINALE – Jane (Gina Rodriguez) struggles to find the right words for Rogelio (Jaime Camil) and Xo’s (Andrea Navedo) ceremony, when she learns about a mysterious letter that Michael wrote before their wedding. Rogelio and Xo are excited for their big day, but Rogelio gets some shocking news that could put things on hold. Once again Rafael (Justin Baldoni) is upset with Luisa (guest star Yara Martinez) and asks her to leave, but Luisa has a plan of her own. Meanwhile, Petra (Yael Grobglas) is skeptical about Jane’s feelings for Rafael which leads her to make a rash decision. Ivonne Coll also stars. Melanie Mayron directed the episode written by Micah Schraft & Jennie Snyder Urman (#320). Original airdate 5/22/2017. 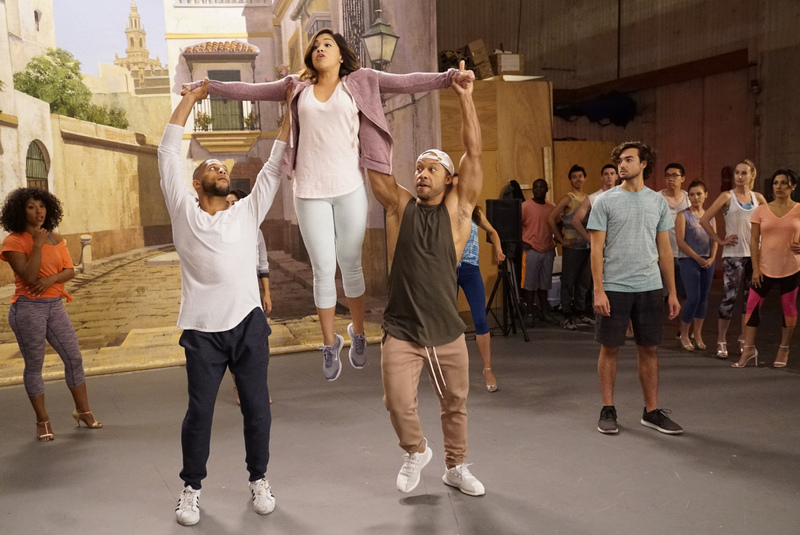 Jane The Virgin -- "Chapter Sixty-Four" -- Image Number: JAV320a_0092.jpg -- Pictured: Gina Rodriguez as Jane -- Photo: Greg Gayne/The CW -- ÃÂ© 2017 The CW Network, LLC. All rights reserved.